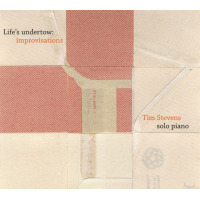 Tim Stevens is an improvising pianist, composer and scholar based in Melbourne, Australia. 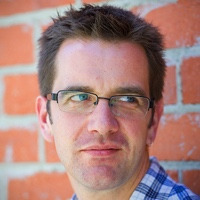 He studied at the Victorian College of the Arts (MMus, 1996) and the University of Melbourne (PhD, 2000), graduating from the latter with a thesis entitled 'The Origins, Development and Significance of the Red Onion Jazz Band, 1960-1996'. Between 1995 and 2000 he was a member of the co-operative trio Browne - Haywood - Stevens, with Allan Browne (drums) and Nick Haywood (bass), and this band released two CDs: 'King, Dude and Dunce' (Newmarket, 1996) and 'Sudden in a shaft of sunlight' (ABC Jazz, 1998). 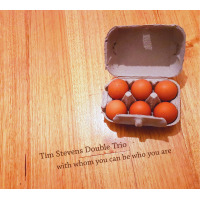 He lived in Sydney from 2000-2001 and formed a trio there with Mark Lau (bass) and Simon Barker (drums), that travelled to perform at the Pori Jazz Festival and Umbria Jazz in 2001. 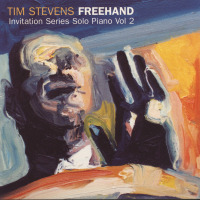 Prior to leaving Sydney he recorded his first album with Rufus Records, the solo 'Freehand'. 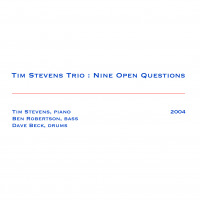 Since returning to Melbourne he has performed and recorded with a trio comprising Ben Robertson (bass), Dave Beck (drums) and himself, and this trio's first two recordings 'Nine open questions' and 'Three friends in winter' have been critically praised. 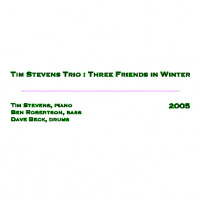 They feature, respectively, Stevens' own compositions and the trio's collective spontaneous improvisation.
. He was also the recipient of an Ian Potter Music Commission in 2001, which led to the composition of 'Four Words of Elizabeth Hunter', on texts by Patrick White, premiered at the 2002 Wangaratta Festival of Jazz. Early in 2008, Tim Stevens Trio released its third album, entitled 'Mickets'. The band appeared at the Wangaratta Festival of Jazz in 2010, both in its own right and working with New York vocalist, Kendra Shank. 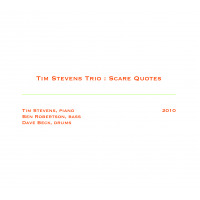 Compositions premiered at the trio's Wangaratta performance were later recorded at ABC Studios Southbank and released in 2011 on the CD, 'Scare quotes' (Rufus Records). All the trio's records have been sent to 'All About Jazz', but none of them has ever scored a review. Obviously this doesn't matter at all. Since then, he has recorded a program of improvisations relating to sacred music he encountered as a child growing up in the Anglican church and singing in a Cathedral choir. This music enquires as to the origins of his musical language, since over the years a great many people have noted the proximity of the hymn book to his playing. 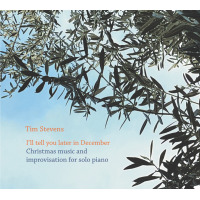 A sequel of a kind, a companion album containing improvisations dealing with Christmas music, is forthcoming. 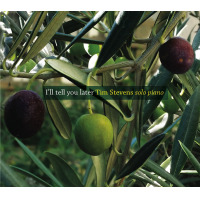 'Tim Stevens has perhaps the lightest touch of all Australian jazz pianists. Certainly he has the quietest sound. 'Yet in person his playing has real presence. On disc you should turn the volume up to experience his singular opalescence. 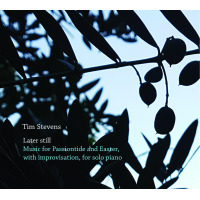 'It seemed unlikely his trio would produce a series of free improvisations, but there they are in the most compelling of their discs. Free improvisation is as often meditative as it is clamorous. There are brief sharp clamours here, but this is essentially an essay in space and tone. It is very compositional, with each instrument working against the others thoughtfully. 'The music unfolds with engrossing logic, exploiting the drama of the pause and sudden lyrical flow. It allows the players - particularly drummer Dave Beck - to expose new expressive potentials. 'Beautiful, buoyant...logical development and sensitive and lyrical interaction. It brings to mind Dutch painter Piet Mondrian, whose works feature changes wrought within a highly disciplined concept...Close listening to subtleties will be rewarded but such listening should be relaxed, as the music is. The sound of the trio, its textures and sonorities, is a joy in itself. 'There are...plenty of rewards for the attentive listener in these eight Stevens originals and the classical 'Litanies', by French organist/composer Jehan Alain. The player’s deep empathy helps to maintain an organic whole amid subtle, yet profound, changes of tempo and mood. All About Jazz musician pages are maintained by musicians, publicists and trusted members like you. Interested? 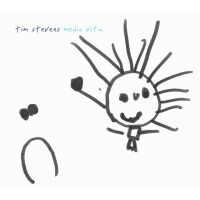 Tell us why you would like to improve the Tim Stevens musician page.